Princess Elizabeth Public School knows that healthy eating goes a long way in promoting student achievement. 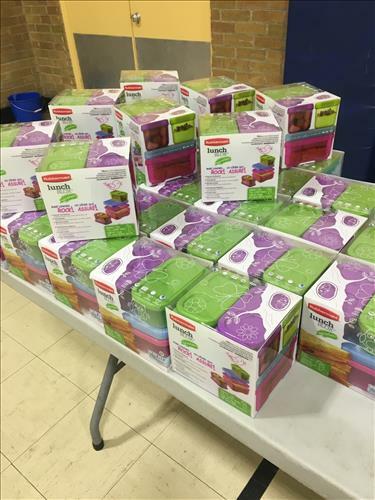 A recent event co-hosted by the Brant County Health Unit and the school’s Parent Engagement group aimed to empower the process of packing student lunches. The event invited parents to learn more about fitting all of the food groups into the midday meal, and even provided some handy storage containers as a takeaway to make it easier to include non-packaged items such as fresh fruits and vegetables. With helpful tips like aiming to include five different types of food to ensure variety with each lunch, and swapping out items like cookies and sugary drinks with great-tasting – but more nutritious – options such as whole grain crackers and milk, a Health Unit representative armed parents with the knowledge and planning needed to ensure lunch has the power to fuel learning. Efforts such as this echo Grand Erie’s Multi-Year Plan, which strives to incorporate parents and community partners’ knowledge and resources to meet the goal of Success For Every Student through the Community indicator, and to foster Well-Being by creating healthy environments that recognize the interconnectedness of mind, body, emotion and spirit. It all adds up to student achievement and healthier habits over the long-term. Packing a healthy lunch and nutritious snacks to enjoy throughout the day can provide children aged 7-13 with 50 per cent of their daily energy needs, according to one statistic the Health Unit provided. And it can all start the night before with that important task of packing a meal for the next day.